Accurate positioning and alignment of a toric intraocular lens (IOL) is crucial to ensure optimal correction of astigmatism. Misorientation of a toric IOL after implantation may occur due to various factors such as capsular bag contraction. Traditionally, toric IOL stability (both orientation and position) has been evaluated through slit lamp biomicroscopy using an axis graticule integrated eye-piece1 or the slit-beam protractor.2 Although useful, these methods are dependent on the patient maintaining a stable and erect head position against the slit lamp at each assessment, and are usually limited to estimating rotation to the nearest 1 to 5 degrees. Equally, this method is subjective which may lead to inconsistencies between different practitioners. We have developed digital, retro-illumination photography with customised image-analysis software tools to objectively compare the position of the pupil/limbal margin with the centre of the IOL to assess centration, and to assess rotation, comparing the toric IOL axis markers with consistently identifiable conjunctival blood vessels or iris features (to normalise for any ocular rotations).3-5 Figure 1 displays a typical image of a TIOL during objective image analysis. Figure 1. An image of a retro-illuminated toric intraocular lens (TIOL) with the astigmatic axis orientation (dashed black line) normalised for any ocular rotation by comparing with the axis of a line joining two consistently identifiable conjunctival vessels (solid black line). The centre of the circular shapes overlaid to define the TIOL optic edge (dashed red line), pupil margin, and limbus (solid red line) are compared to determine TIOL centration. Zuberbuhler B, Signer T, Gale R & Haefliger E. Rotational stability of the AcrySof SA60TT toric intraocular lenses: A cohort study. BMC Ophthalmology. 2008; 8:1-5. De Silva DJ, Ramkissoon YD & Bloom PA. 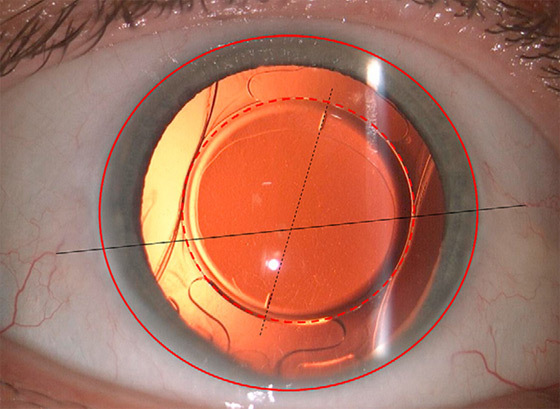 Evaluation of a toric intraocular lens with a Z-haptic. J Cataract Refract Surg. 2006; 32:1492-1498. Shah GD, Praveen MR, Vasavada AR, et al. Rotational stability of a toric intraocular lens: Influence of axial length and alignment in the capsular bag. J Cataract Refract Surg. 2012; 38:54-59. Visser N, Berendschot TT, Bauer NJ, et al. Accuracy of toric intraocular lens implantation in cataract and refractive surgery. J Cataract Refract Surg. 2011; 37:1394-1402. Wolffsohn JS & Buckhurst PJ. Objective analysis of toric intraocular lens rotation and centration. J Cataract Refract Surg. 2010; 36:778-782.